This page summarises information and statistics on the value of getting a degree. Any way you measure it, a college degree is the best investment of your life. In today’s dollars, a bachelor’s degree is worth more than $2.1 million over 40 years. “Having that post-secondary diploma can make such a difference in lifetime earnings,” said Washington, D.C.-based Employment Policy Foundation President Ed Potter. During a recession, obtaining a college degree, including those from online universities, becomes even more crucial. According to the U.S. Department of Labor, all seven of the job categories that are predicted to grow faster than average during the next decade require a college diploma. These careers, which include teaching, healthcare and technology, will account for 42 percent of the nation’s projected job growth by 2013. Conversely, men and women without a post-secondary degree are losing ground. The Department of Labor reports that employments for those with bachelor’s degrees grew by 1.8 million during the past 10 years compared to a loss of nearly 700,000 jobs for those armed with a high school diploma. But earnings are only part of the benefits. A college education enriches your life in ways that cannot be measured by dollars. “Education is power,” Frederick Douglass observed nearly 150 years ago. Today, education remains the path out of poverty toward opportunity. It is also the route to achievement, enrichment, knowledge and success. Most important of all, education makes dreams come true. Whether personal or practical, the college experience can be both life affirming and career enhancing. The classroom and the coursework expose you to diverse people and ideas. They open up a world that challenges and stimulates you in ways both big and small. You’ll discover new interests or pursue familiar subjects with passion and depth. Business, history, literature, teaching, medicine, technology, the arts — the list is endless. Along the way, your knowledge base expands, your critical-thinking skills become sharper and your confidence grows. A career that is professionally satisfying and intellectually stimulating; one that taps into your potential and challenges you to perform at your peak. A profession that is in demand with upwardly mobile opportunities. An arsenal of skills that empower you to control the pace and direction of your career. A secure future that comes with a steady profession that can ride out any economic roller coaster. Even during a recession, the U.S. Bureau of Labor projects that 23 million jobs will be created in the next decade. People with a bachelor of science in business administration will be able to find jobs easier as management-related occupations will account for nearly a third of the total, according to the Employment Policy Foundation, a non-profit, non-partisan research and educational foundation focusing on workplace trends and policies. In addition, a just-completed survey conducted for the Chronicle of Higher Education shows that despite unease with the economy, Americans faith in higher education is unwavering. The nation continues to have confidence in the value of a college degree, with more than half of respondents saying it is “essential for success.” Your future depends on it. Salary.com is a leading provider of on-demand compensation management solutions helping businesses and individuals manage pay and performance. A recent study in the United States revealed that 2007 university graduates earned 77% more per hour than those with only a high school diploma. Even though MBAs lost a little of their shine in the GFC, they are back in demand with hot prospects for MBAs in 2011. If an MBA isn’t for you, then you might want to consider an engineering degree. 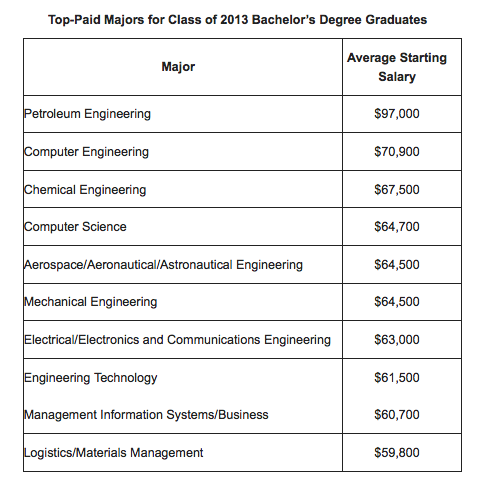 Have a look at the table below for starting salaries for holders of Bachelor Degrees in 2013. Thanks to Ray Keefe of Successful Endeavours in Melbourne for the heads up on this latest research! Thanks for publishing such a useful guide for those considering the financial aspects of a career. I have been fortunate to have a job I love because I studied electrical engineering and so I also understand that doing something you love is also a great thing.